So I’ve been working on PyGame for PyWeek lately and I’ve been having a lot of fun. I also took a weekend off from my email so I did not notice that Lord Taran has been creating Spanish translations for a bunch of my PyGTK tutorials. If you are interested in the Spanish tutorials check them out, or if you are interested in seeing what happened at pyweek and the car crash that was my entry check it out as well. All right, this is just a little tutorial about working with text in pygame. Now, this isn’t the only way to work with text, there are many other methods to do this, in fact much of the time you’ll probably end up using images for interactive text. So this is mainly meant to serve as a informative guide to using the text features in PyGame, and how you might want to implement them. The full source and necessary files for this tutorial can be downloaded here. We import pygame and then we set a define TEXT_WIDGET_CLICK , which will be used later on as the event type when the TextWidget is clicked on. I wanted to be able to control what happens when people set values in the class. So, for example, if you set the size of the font to be something, I wanted the display to automatically adjust to reflect the new size. I haven’t really used new-style classes before so I thought I’d try them out. Hi everyone just a quick post to let you know that I probably won’t be posting much during this month as I have decided to participate in nanowrimo which leaves me almost no time to come up with tutorials. I as mentioned in the past Satoshi Tanabe over at satolog has translated a few of my tutorials over into Japanese, which is very cool. It also turns out that someone over at blog.chinaunix.net has also translated one of my tutorials (Building an application with PyGTK and Glade) into Chinese, again very cool! Thanks a lot for the translations guys. Of course that doesn’t show very much but it show show my scrollbars! The problem with building the level editor is that y you always have to keep working on the smallest details (like a scrollable area0 before you can get to the real heart of the problem. Oh well it’s till fun! Recently I’ve been playing around in PyGame for the past PyWeek and having a blast! Sadly my PyWeek entry was mostly a bust as real life got the better of me, but it reminded my how much I enjoy python and doing simple game programming. Hopefully I’ll continue on with both my PyGTK and PyGame work! If you like Python and are interested in creating games, I definately think that you should check out PyGame. All right in this section of the tutorial we are going to start adding the bad guys. If you are familiar with the changes that we made in part two it should be pretty clear to you how are are going to create these bad guys. If you haven’t already you should check out part one and part two. If you would like the full source and all of the images you can get it here. For now we’re not going to go too crazy in our enemy AI, we’re just going to get them to choose a random direction to move and move in that direction until they hit a wall. We’ll also add in another option where after a certain amount of moves the monster will choose another random direction. This is just to add a little but more randomness into the Monster, it’s not really what we’d like to use at the end of the day but it works out all right. 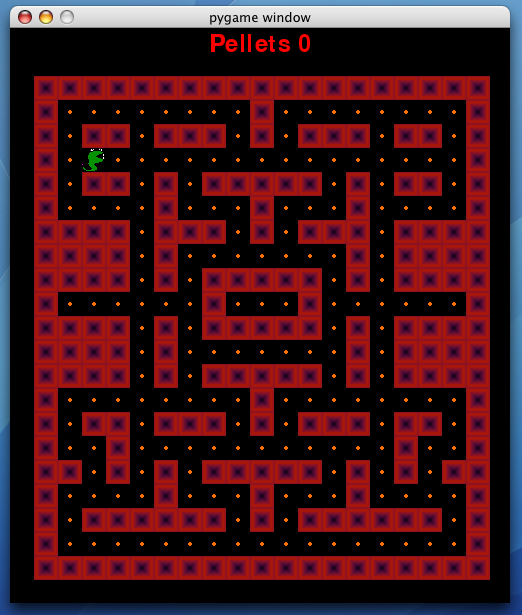 All right in Part one we actually created a semi-working almost-game, in part two we’re going to go a bit further, in part two we’re going to add the walls that will make help make PyMan (our python based PacMan clone) an actual game. Note: Part one has been mistakenly half-deleted by me, so it is not fully available at this time. I am working to re-write it so it should be up soon. Note: I also changed the images that I used in Part one so now we have a new smaller snake. You can download the full source for Part Two here. What we are going to do is base some of our level code on a great PyGame tutorial over at DevShed specifically the idea of the level layout. This is something that has always puzzled me about games, how they create their levels? I’ve read some articles and beginnings of books but I’ve never really be able to understand it, but the multidimensional array approach discussed in the DevShed article is nothing if not simple. So the idea is that our game world, or game board, will basically be a grid of 24×24 pixel items, and we will have a multidimensional array or list that we will used to describe it. Where 0 is nothing and where 1 is a blue square. We could then add 2’s if we wanted to and make those red squares, or anything else that we wanted. So that is basically how our levels are going to be defined. In order to follow along with this tutorial you will need Python 2.4 and PyGame 1.7.0+ installed. Since I’m doing this all on a Mac and Python 2.4.2 is not available from MacPython or any other site as a disk image I decided to install from source. If you are try to build Python on a Mac as well you should probably install into the /Library/Frameworks path as explained by this site. For Windows or Linux you should be able to install easily given the instructions on the Python site. The full source of this tutorial can be downloaded here. So let’s actually start creating this game using PyGame. For our snake image in the game I’m going to use the snake to the left for now. As you can see I’m not artist, but I was able to install the gimp on my Mac and get that image to a point that I think is relatively acceptable. If anyone out there has any graphics skills and can whip me up a better looking python in a 64×64 png I’d gladly use it! So the first thing we are going to do is create a new PyDev project in Eclipse. I’m going to use Python 2.4 for this project because it is the version that is compatible with my PyGame Installation. 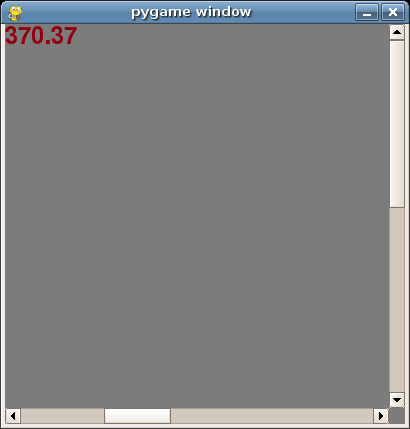 Then I’m going to create a new file called PyMan.py, this will be the main file of our game for now. The architecture may change as I go through this and discover better ways to use the files in my projects but for now this will work as a main file. In the directory that I create my project I will also create a subfolder entitled “data” and in that subfolder I will have another folder entitled “images” where I will store the above snake.png image. Note: A lot of the information in this post was taken from the Pete Shinner’s great Line by Line Chimp and Python Pygame Introduction tutorials. Well as someone who programs a lot and likes using computers creating a viedo game is always something that I’ve wanted to do. In the past I spent a lot of time learning OpenGL and actually went quite far in the creation of a simple/not-so-simple game. The game was put on hold indefinitely once real life responsibilities started to encroach on my evenings. Since then I’ve longed to try again.